These are some of the MRI images I look at when evaluating the plantar fascia for injuries. I wanted to show mainly the coronal images which typically show the injury the best. On this first view we see the sensor is just under the medial slip of the plantar fascia which is healthy when dark black as in this case. The "itis" of plantar fasciitis is seen by the white under the darker plantar fascia. These next views follow the medial slip of the plantar fascia about 3 inches in front of the heel towards the arch. So, this image is closer to the arch than the first one I showed. Check as normal plantar fascia gets closer to the arch it will thin out, but remain dark black. The area under and around the sensor is the normal fat pad of your heel. The heel bone is dark black above the plantar fascia. As we go further out into the arch, the wonderful arch muscles and veins and tendons all come into view. Here is the final coronal view of the plantar fascia. We have traced it from under the heel forward into the arch. You can appreciate all the incredible structure in the arch. Same patient but now we are looking form the side. See how the plantar fascia starts under the heel and goes into the arch. It should look solid, consistent, and one thickness. Unfortunately this is on the opposite side. See the plantar fascia above the sensor is very dark on the bottom and irregular/gray on the top. This is an old plantar fascia partial tear which has somewhat healed. This is the same patient from above with the old plantar fascial tear. Compare this side view with the image 2 above. See in this image the plantar fascia is thinner by the heel, then gets thick, then thins out as you go into the arch. This thinner area by the heel is the first hint something is wrong. We know by looking at other images that that area was injured and attempting to heal. Here is another patient with an acute (just happened) plantar fascial tear. The plantar fascia has just exploded from the heel. Same patient from above. Missing plantar fascial medial slip due to recent tear. We will now follow this forward into the arch. See how the plantar fascia starts to show normalcy as we move forward. I had the pleasure of attending this great lecture in 2013. It changed my treatment thoughts on CRPS. It may me favor Ketamine Infusion over Spinal Cord Stimulator in severe cases. And now Calmare Pain Therapy seems to have a valid place. As a podiatrist I can only recommend some treatments, but this is in the world of pain management specialists rightfully so. As you begin your treatment to maintain your bunions in an attempt to avoid surgery, think about all the possible treatment choices you have available. 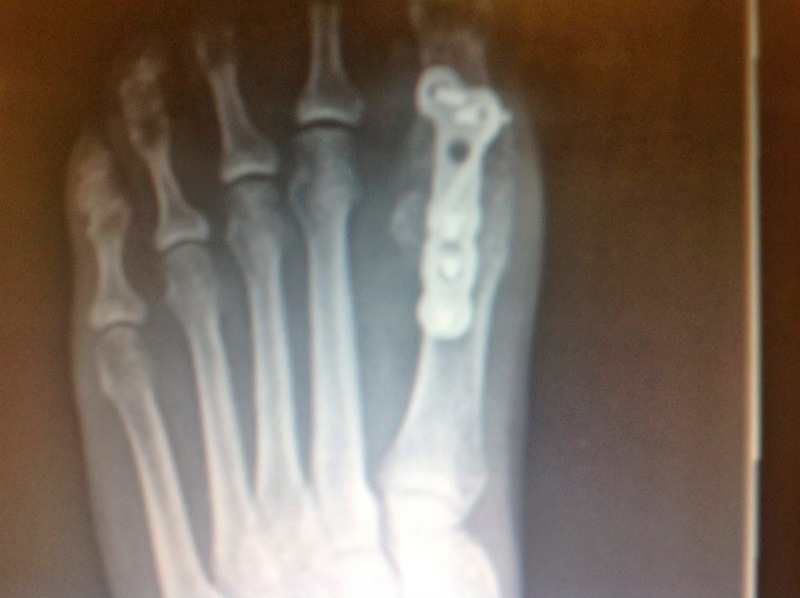 So many of my patients with Hallux Rigidus do not like the thought of big toe joint fusion, and I share that thought. I have only two patients in my practice and they are doing well post surgery. I present this article abstract to help with pro/con list we all create when trying to choose between different treatments. I would still recommend joint fusion in only small instances, but when I do recommend the procedure articles like this help me feel better that the patient will do well afterwards. 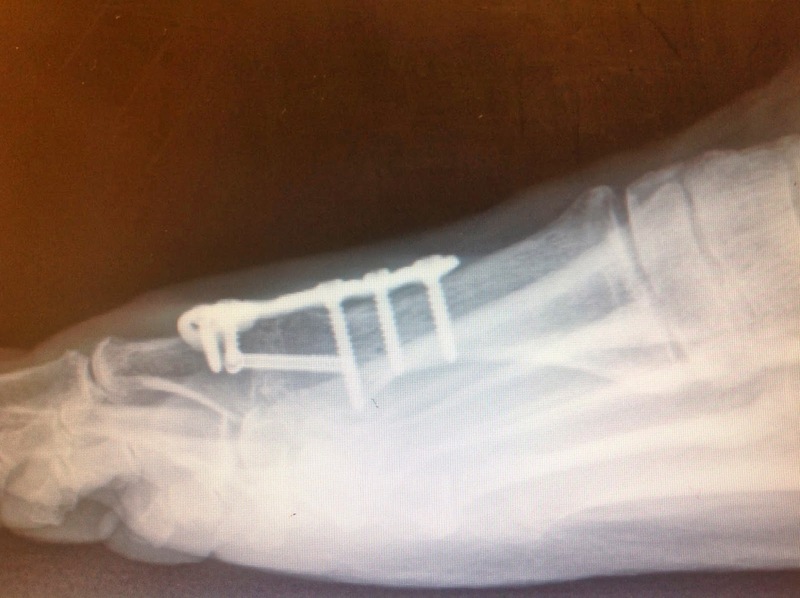 Below are the foot x ray images of my patient who is doing very well with her big toe joint fusion. The hardware is scary, but she is stable, pain free, and comfortable walking. She is 2 years post fusion by our podiatrist Dr Remy Ardizzone. Dr Ardizzone is very skilled at cheilectomies (joint clean outs) and implants, but felt fusion due to the severe joint arthritis was the best option. My patient is happy with the results. New Website for Heel Pain Sufferers: I hope it helps millions!! I wrote to you a couple of months ago and asked if you would mind if I embed one of your videos onto a website I was building about heel pain. The one showing the plantar fasciitis wall stretch is the one that I wanted to use. Hope you like the way it turned out. I have a link to your site also. I could add another one or two videos if you want; let me know if there is one specifically that would fit. Calmare Therapy: A Rising Star for Nerve Pain (even CRPS)!? Hi Dr. Blake, I have some very exciting news to share. I have been on the East Coast having some experimental treatments for the last three weeks. A new generation of electronic device that delivers healthy nervous system signals to the brain, somehow erasing old pain pathways. I was very skeptical initially, seemed like one more silly Tens kind of gizmo, but I have been completely astounded at the results. The technology does not rely on the Gate theory of pain, but rather on a different kind of signal theory. Almost all of the pain and allodynia has been eliminated from my foot. It is like a miracle. I don't know how long this improvement will endure. Most patients experience some regression over time, and need additional treatments. and I also will have a lot of rehab to do to get a normal sock and shoe on that foot, and very gradually rebuild strength and endurance in walking. But for right now it has given me so much hope to have relief from that horrible neuropathy that was like the worst kind of torture. The name of the machine is called Calmar. There have been some small scale studies demonstrating efficacy, and larger scale trials, including at the Mayo Clinic, are now underway. It is effective with CRPS, post herpetic neuralgia, diabetic neuropathy, and post chemo therapy neuropathy. Goodness knows these are all patients who need help and hope. I know you care so much about your patients and have been trying very hard to find solutions for me and others. I will send you more information when I get home. Unfortunately my L5 – S1 disc issue, which was a sleeping tiger, has been set off by the travels, so I am having very painful sciatica now And will have to get that calmed down. But even that is nothing compared to the CRPS. I'll be in touch with more information about Calmar, when I'm home and doing a little better. I hope you are doing well and thank you again for all your care and concern. I've had five years of dealing with chronic re-injury of the posterior tibial tendon and achilles.I've never let it go too far, but stop and rest for three weeks to three months, incorporating taping and strengthening until it feels strong enough and no pain. After twenty practitioners and thousands spent on modalities and orthosis, I am no further ahead, although my first orthotic had a flange up the side-back of the heel that stabilized the foot and healed it more quickly. My longest time without injury was when I went minimalist, stuck to a soft trail and did steep hill workouts(I've loved running for 25 years; I miss it so very dearly). I wonder if this strengthened my PT and achilles enough to stay running? I greatly reduced mileage.I went back to roads due to winter conditions on the trail and within months was injured again. It is so anxiety-provoking to live this crippled. Could a leg length discrepancy be at fault? I also have a pelvic tilt, according to my chiropractor, and hyper-eversion(valgus) of the affected foot at the ankle bone.And hip arthritis and OCD lesions in the knees, but the PTT is a deal-breaker. It seems I cannot keep this foot neutral, no matter how much work I do on my gait or core.I know the ankle seems "loose". 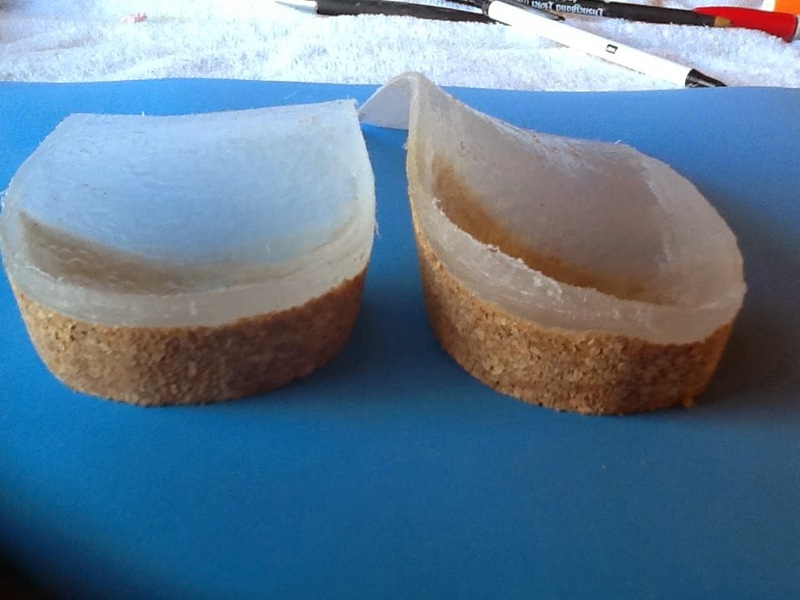 Will it help to build up my own orthotic(currently, a custom SOLE) How do I find the material and tools, and can I use duct tape? :) I am willing to experiment; I have done a lot of it with shoes and insoles, but feel a bit out of my league! 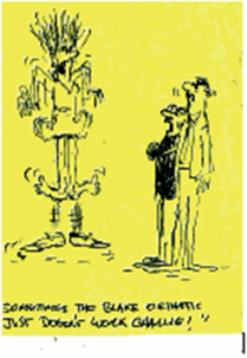 Do you think you could make me an orthotic that works? I am 50 years old, but it is the new 80! I don't want to be in a wheelchair in ten years. Thank you so much for your earnest blog and practice! Dr Blake's comment: Marina, thanks for your wonderful compliment. I have a wonderful love hate affair with Posterior Tibial Tendon Dysfunction. Developing the correct orthotic device is a crucial first step in stabilizing you, along with arch taping, PTTD Braces and then tons of posterior tibial strengthening. Check out the many blog posts on this site on PTTD. It takes alot of work to get the right orthotic, so I would be happy to try if you want to come to San Francisco. Not a bad place to have a two week vacation. The minimum time would be an initial Fri afternoon visit for evaluation and orthotic stuff, followed by a dispense visit on Monday AM. This has to be all arranged. Perhaps followup can be done locally by a podiatrist or orthotist. Contact me directly through by email and I will arrange things, give me 2 or 3 weekends that you can do this. If their is someone locally that can at least adjust my work, that would be wonderful. The video below discusses this problem. Patients whom have very tight achilles tendons can use this technique to stretch out very gently in a relatively short time. An exercise band (like this yoga strap) is used to place a continuous stretch on the achilles tendon. The strap is anchored around the waist so that the patient does not need to stand or hold the band during the prolonged stretch. 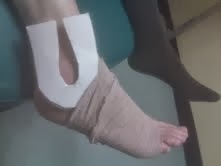 A towel is placed under the foot to protect the foot. Then, heat is applied under the calf for 20 minutes, and then switched to a 10 minute ice pack. The secret is to hold the stretch consistently and painlessly for the entire 30 minutes. You need a friend/partner to help with set up and to change the heat pack to ice pack at the 20 minute time interval. Dramatic increases in flexibility are noted within several weeks. Typically this is done every third day, with normal stretching 3 times per day on the off days. It is important to protect the knee while holding this stretch by rolling a towel under the knee to keep it slightly bent. You must make sure your spine is stable as you rest against a firm supportive surface. Stop if any pain develops anywhere. Review with a physical therapist to make the exercise safer for you. Later this week I will share 2 emails from patients with severe nerve pain both helped recently with laser treatment. I am going to research these topic to bring to you as it seems like a quantum leap forward in the treatment of many problems. Update on my foot - After I saw you, I soaked my left foot every night and after a few days, the hole started to get red and it hurt again. I continued to soak, but after soaking and rinsing off, I bandaged it with this drawing salve for 4 or so nights. The pain went away and I think the hole in my foot is closing up nicely now. One other thing, do you remember right before I left, I told you I thought I had another hair in my other foot, but we both didn’t see anything? It turns out I did have something in there! I started to feel a bump a day after I saw you. I soaked it for a week or so along with my left foot and whatever it was came out! Thanks! Sunday's Video of the Week: Introducing the Footfunnel: Could it solve the shoe horn problem? So many of my injured, disabled, patients have a hard time getting into their shoes. Long shoe horns help, but not always. The Footfunnel may be a podiatrist's dream invention. Check it out. I am always in search of wonderful and safe exercises that help us keep our lower extremities strong. This is a great exercise and a great addition to my original video on Single Leg Balancing. As we improve in our strength and stability, we need to find ways to make these exercises more and more challenging. It is easy to pick up these exercise bands (our office uses Theraband). Good luck. If you are going in for a hip replacement, try to get the most information you can about how you can avoid or minimize a short leg. I have found only a few hip replacements to have no residual short legs, and so it is standard of care to have a short leg after. But, this means, lifts for the rest of your life in shoes or added to the bottom of shoes. I have many posts in my blog on the topic of treating short leg syndrome. This wonderful article below kindly discusses the problem. With supposedly 80% of the population having a short leg, it does mean that at least 80% of these surgeries will leave a short leg and need for a lift guy/gal like me to help post operatively. This is complicated by the fact that any surgery will temporarily weaken the joint involved. When it comes to the hip joint, when that area feels week, it throws off the gait, and makes it feel either long or short. Standing AP Pelvic Xrays post hip replacement can tell you what side of the body to place the lift, and it may not be the side you feel is short. Hi i have plantar fasciitis in both feet and have been told i need injections but i am terrified of needles. I was wondering how much it actually hurts, and whether you can return to work the following day? 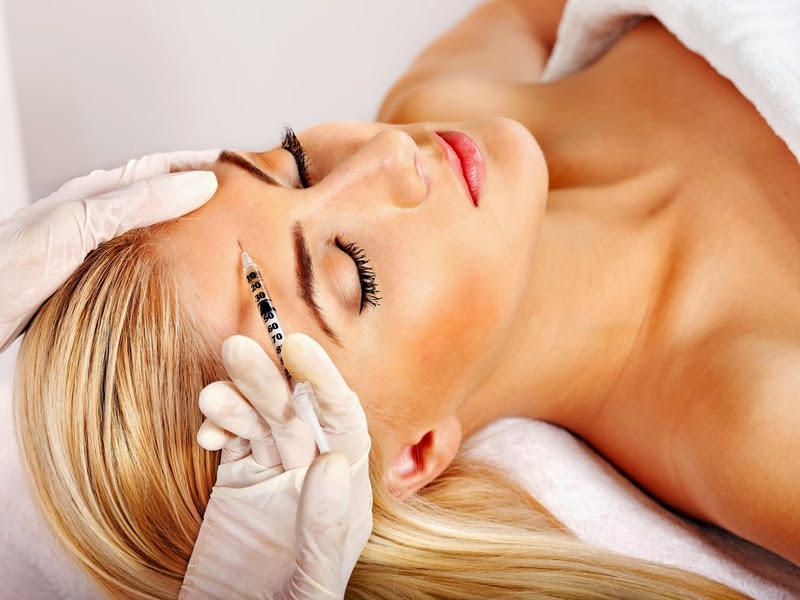 One Image to give yourself if you are going to get an injection is that the injection is going to make you more beautiful inside and out. I am hoping one of these 3 photos clearly captures the longer left foot. These inserts were removed from the shoe to check why the left second toe was continually being irritated. He was sent home to check other shoes to see if this was a consistent pattern. This will help in my recommendations on shoe buying. With some situations, patients with this problem need to buy 2 pairs of different shoe sizes and chose one from one pair and the other from the second pair.